My First "Google Glass App"
I made what my friends consider a poor purchasing decision - and what I hope will pay itself off in the long run. I bought an explorer edition of Google Glass. The purpose, of course, was to start developing for them. 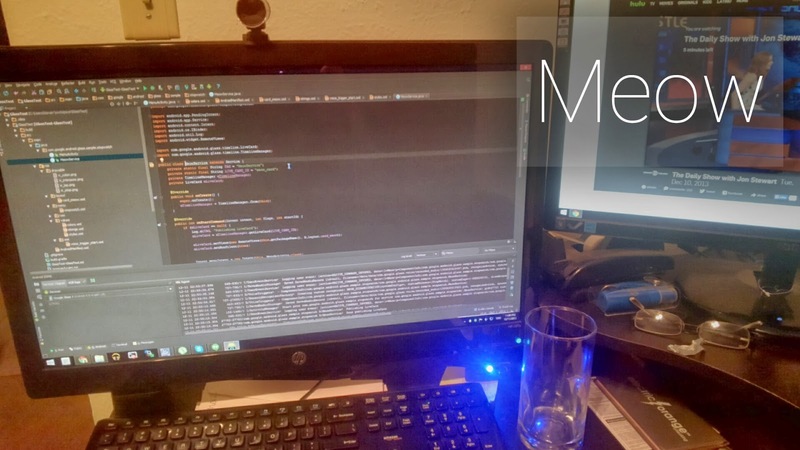 I'm a programmer at heart and programming is what I want to do. 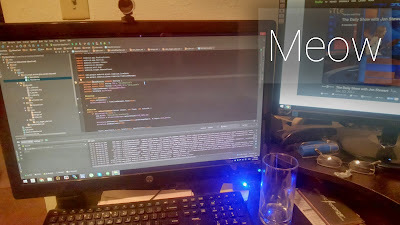 It took about a week before I finally got around to making my first app, and of course being an Android developer I wanted to play with the newly released "Glass Development Kit" or GDK - the API on top of Android specifically for Google Glass Apps - not the mirror api cards. So I took apart one of Google's samples, as I'd never worked with Services or RemoteViews before. It says "Meow" (on the card) when you trigger it using the voice command "OK Glass, Meow." To do this, I had to create a few things: MeowService - the service running in the background that controls the LiveCard, meow_card.xml - the layout file that simply says "meow", MenuActivity - the required intent when interacting with the live card (yes, required! ), and voice_trigger_start - a trigger with the text to launch the app, and of course AndroidManifest.xml, but that's barely important.